Cookout season will soon be here. So it’s time to seek out side dishes! Like this one. Coleslaw is always a hit. And you can’t go wrong with bacon. Put them together and . . . instant favorite. This dish is terrific all by itself, too. Or use it to top a pulled-pork sandwich, or even to garnish fish tacos. This coleslaw is versatile. And that’s no hogwash. Creamy Coleslaw is a classic dish. But we like vinaigrette-based slaw even better. One of our favorite vinaigrette slaws is Jalapeño Coleslaw with Pimentón. So we’re using that recipe as a base for today’s Hot Bacon Coleslaw. But instead of a traditional vinaigrette, we’re substituting a version of the dressing used on our Spinach Salad with Hot Bacon Dressing. We like to use jalapeño peppers in this coleslaw (they provide more ping than heat). But if you’re just not feeling the pepper, feel free to leave them out. Prep time for this recipe is about 10 minutes. Cooking and assembly add another 15 minutes. You can do your prep work hours ahead of time, then finish the dish right before serving – see Notes. This dish is best served hot from the stove, but it’s also good at room temperature. Leftovers keep well for a day or two if refrigerated in an airtight container. Heat them before serving. Cut the bacon into pieces of ½ to 1 inch. Spread the bacon pieces out over the surface of a cold frying pan. Place the pan over medium stovetop heat. Cook until the bacon pieces are beginning to brown (about 5 minutes). Meanwhile, peel the onion and cut it in half (reserving one half for another use). Cut the remaining half onion into dice or slices of ½ inch or a bit smaller. Set aside. Wash the jalapeño peppers and cut them lengthwise. Use a teaspoon to scoop out the ribs and seeds (be careful, the oil on these is hot; keep fingers away from your eyes). Mince the pepper roughly (you may want to reserve a few slices for garnish) and set aside. Then wash your hands with soap and water to remove the hot oil from your skin. Set aside. By now, the bacon should be just lightly brown. Remove the bacon pieces from the frying pan (but don’t empty the grease), then drain the bacon on a plate lined with a paper towel. Add the chopped onion and jalapeño to the bacon grease in the frying pan, season with a few pinches of salt, and sauté for 4 minutes. While the onion is cooking, wash and dry the cabbage, then cut it in half (reserving one half for another use). Cut the remaining half cabbage in half again, then remove the core. Cut each piece in half again, then use a knife to shred the cabbage across the width of each piece. Cut the cabbage into shreds of 1/8 to ½ inch (depending on your preference). Add the shredded cabbage to the frying pan and cook for 5 minutes (the cabbage will still be a bit crunchy at this point, so cook it longer if you want the texture to be softer). Add the cider vinegar and the celery seeds to the frying pan. Stir to combine, then cook down the vinegar for a minute or two. Taste the cabbage mixture, then add black pepper and more salt if necessary. Stir in the cooked bacon pieces. Serve the slaw, garnishing it with jalapeño slices if you wish. As noted above, you can do most of the prep work for this dish hours ahead of time if you prefer. 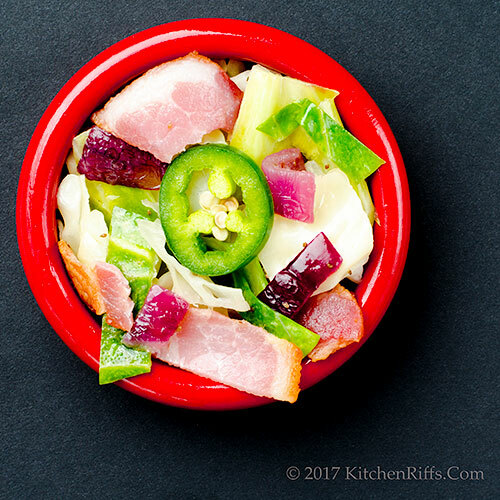 Slice the bacon, onion, jalapeño peppers, and cabbage, then refrigerate them in airtight containers until you’re ready to cook. For extra flavor, add a teaspoon or two of mustard to this dish (along with the vinegar in Step 6). You can use any mustard you fancy, but we suggest Dijon style. If you prefer a sweeter slaw, add about a tablespoon of brown sugar in Step 6. Don’t like celery seeds? Substitute caraway seeds, or omit the seeds altogether. Need a substitute for cider vinegar? You can use wine vinegar, or even ordinary white vinegar. You can use either regular green cabbage or Savoy cabbage in this dish. Red cabbage would work well, too. How much salt and pepper to use? As much as tastes good to you. If in doubt, use less initially than you think you’ll need. You can always adjust the amount at the end (Step 6). This coleslaw makes a great side for almost any grilled or barbecued meat. It would also go well with a spicy sausage like Kielbasa, or even with roast pork. Like shredded cabbage on fish tacos? 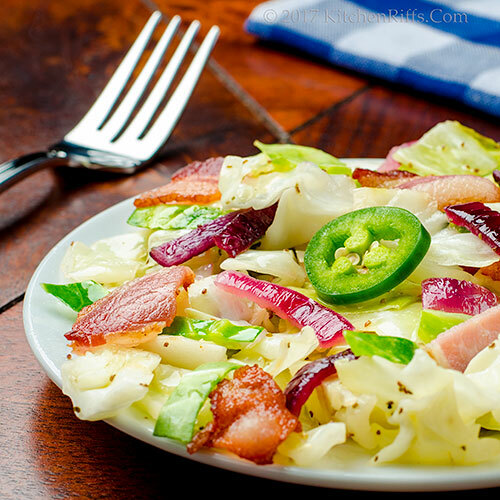 We think this hot bacon slaw works even better. Fish and bacon make a wonderful flavor combo. “Guess I’m just a ham,” I said. “Didn’t I just warn you about pig humor?” said Mrs K R. “Now there may be reporkcussions. True. I’ve never made a rasher decision. I add jalapeño to EVERYTHING! This coleslaw looks wonderful--I prefer vinaigrette-based to creamy, also. I prefer vinaigrette-based slaws as well, and who can't resist bacon. LOve how you balanced the flavors with the salty,savory, spicy and sweet. Thanks John. Hi Kelsie, hard to resist the allure of jalapeño, isn't it? :-) Thanks for the comment. Hi Cheri, bacon is, well, bacon. Impossible to resist. :-) Thanks for the comment. I am obsessed with jalapenos lately! This salad sounds wonderful for any time of year. That does look good, and just time time for patio season! I would go as far as poaching an egg on top! I love the vividness of the colors on your photos, especially those pieces of bacon. Making me hungry, John. Thank you for the share. Hi Laura, can never go wrong with a jalapeño! We love those spicy dudes. :-) And this is a great cold weather salad as well as an outdoor one. Thanks for the comment. Hi Pat, bacon and jalapeño bring anything to a new level. :-) Thanks for the comment. Hi Eva, like the idea of a poached egg on top! It'd make a nice dinner dish. Or breakfast. :-) Thanks for the comment. Hi Ray, bacon always makes me hungry! :-) Thanks for the comment. Ten minute prep? You have my undivided attention. With sunshine on the horizon I want to spend more time in the garden and less in the kitchen! This savory salad is just the type of recipe I want to make. Hi Deb, cooking/assembly time actually is longer than the prep time on this. You'll love this salad! SO full of flavor. :-) Thanks for the comment. Nice! Great combination of flavors & textures. I love all the different flavors in your coleslaw,especially the bacon. Definitely with jalepeno, John. This looks really tasty. According to my boys bacon is its own food group. They would love this and with the jalapeno as they like it spicy too. Great little spring/summer recipe. FATTTTTT with cabbage is one of my FAVORITE pairings!!! I love to try new slaw recipes and this one looks right up my alley. Non-creamy slaws are always at the top of my list. Hi Pam, this really is nice, isn't it? :-) Thanks for the comment. Hi Gerlinde, hard to say no to bacon, no? :-) Thanks for the comment. Hi Angie, we do love spicy stuff! :-) Thanks for the comment. Hi Bobbi, your boys are right -- bacon is at the top of the food pyramid! Or maybe it should be the bottom. :-) Thanks for the comment. Hi Lea Ann, this is dynamite on a pulled pork sandwich! Thanks for the comment. Hi GiGi, we're pretty fond of fat with anything. :-) Thanks for the comment. Hi Evelyne, this really is a meal all on its own, but with BBQ? Wonderful! Thanks for the comment. Hi Pamela, one can never have too many slaw recipes. Or bacon ones. :-) Thanks for the comment. Your recipe is full of great ideas -- I love cabbage salads with vinaigrette dressing. I think I'll go improvise one for tonight! Hi Mae, cabbage makes a great salad, doesn't it? It's a fun ingredient to play with. :-) Thanks for the comment. John, your food is always so vibrant, flavoursome and down to earth. Peter would like this version, being no mayo. Thanks! Such a simple salad but full of flavor! I better eat more cabbage. Hi Liz, we're definitely down to earth around here! :-) Thanks for the comment. Hi Holly, as if you don't eat enough cabbage in kimchi! :D Thanks for the comment. Well, I could just pig out on this! Love a bacon dressing and celery seeds and apple cider vinegar make the most perfect cole slaw in my opinion! Saving this one for sure! I love vinegar based coleslaw. This one looks like a winner. I would love eating as a side or on top of a sandwich. Hi Abbe, we definitely did pig out on this. :D Thanks for the comment. Hi Denise, bacon is good! :-) Thanks for the comment. Hi Dawn, we probably make 10 vinegar-based slaws for every mayo one. Heck, maybe 20:1! Thanks for the comment. I just made a pulled pork sandwich for lunch and made coleslaw to plop on top of it but it didn't look as good as this! HI Maureen, bet you'd like this! So nice with BBQ. :-) Thanks for the comment. What ever happened to hot bacon dressing! Oh, how I miss it. But not any more - I'm sure I'd love it with this slaw. What a great idea! Hi Jeff, hot bacon dressing is good stuff, isn't it? And yes, you'd love this slaw. :-) Thanks for the comment. Hi Peachy, you'll love the bacon in this! SO tasty. :-) Thanks for the comment. John, this is fabulous - I could eat this for breakfast, lunch and dinner! I like the way you described the jalapeno - "more ping than heat." Hi Jean, I can confirm this makes a great breakfast. :-) Thanks for the comment. 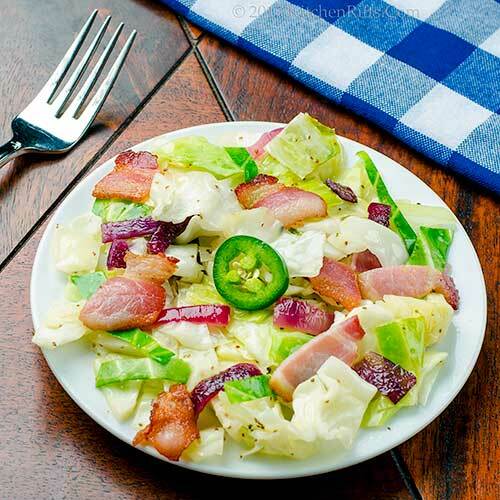 Beautiful salad and I love the idea of adding bacon to it...so much tastier, and I too like better vinaigrette-based slaw...thanks for sharing such a delicious recipe John! Hi Juliana, bacon makes everything better. :-) Thanks for the comment. I could make a meal out of this slaw - and we love a vinegar slaw especially with pork. Thanks for sharing this lovely recipe John - I need to try this "with" jalapeños please! Hi Tricia, definitely try this "with." :-) Thanks for the comment. Hey, I like the idea of putting this bacon slaw in fish tacos- I'm always on the lookout for improving my fish tacos! Looks delish! Hi Fran, this really is good with fish tacos. Might want to add some chopped cilantro to the mix, but it's good as-is. Thanks for the comment. And love the spin on a traditional recipe, everything is better with bacon. I've never thought about adding bacon to coleslaw - what a great idea. This really looks and sounds fantastic. 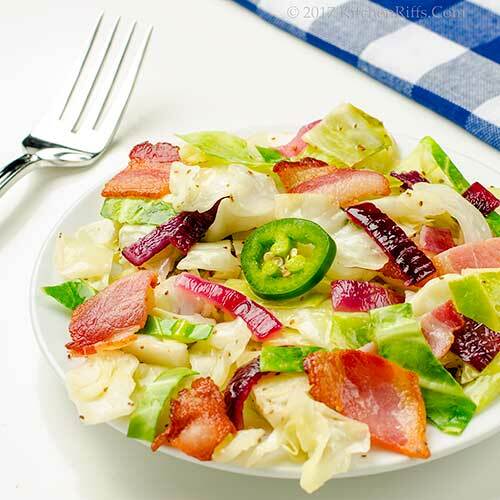 Years ago, when I was in high school, my mother and I would go to Marie Calender's and I always got a certain salad with a wilted Bacon dressing. Wilted, because that's what the hot dressing did to the salad. And don't judge. This was 1970, and Marie Calender's was all there was in Salt Lake City, Utah!!! But it was good! Hi Anna, we'll never say no to bacon! :-) Thanks for the comment. Hi Caroline, you have to try this -- SO good! :-) Thanks for the comment. Hi Mimi, spinach and hot bacon dressing is a classic, and the dressing always wilts the spinach. Good stuff! We like using this dressing with bibb lettuce, too. Thanks for the ocmment. Yum! This looks delicious (and I'll definitely take mine WITH the jalapenos). Hi Amy, "with" for us as well! :-) Thanks for the comment. We love coleslaw, but this is a whole new experience. I like all the addition specially the bacon. This is a recipe worth trying. Thanks John. Hi Chris, WAY too easy to do that! :-) Thanks for the comment. Hi Amira, bet you'll like this! Tons of flavor. :-) Thanks for the comment. Bacon and cabbage? I am definitely in. This does make a wonderful side dish at bbq parties and I will definitely be including (extra) jalapeno! Thanks for sharing. I love jalapenos like anything and this stunning looking salad is speaking to me, John. Absolutely loving the combo of salty, savory, spicy and sweet flavors here. Thanks for this wonderful share, John. Hi Yi, hard to go wrong with those ingredients, isn't it? :-) Thanks for the comment. Hi Anu, this is a great salad! A lotta flavor going on here. :-) Thanks for the comment. Hi Marcelle,you'll like -- this is good stuff. :-) Thanks for the comment. So yummy! I love bacon, celery seed, the works!! Hi Liz, this really is a fun -- and delish! -- dish. :-) Thanks for the comment. Hi Greg, hogwash indeed! :-) Thanks for the comment. You can't go wrong with bacon... truer words were never said. Hi Frank, love bacon! And it's wonderful in this recipe. :-) Thanks for the comment. Great recipe - I love all the variations you provided, and especially the thought of it on a fish taco. Yum! Hi Beth, this is really good as part of a fish taco! Thanks for the comment. Hi Anne, you'd love this! Warm slaw is different, but SO good! Thanks for the comment. This sounds like a nice change of pace and yes, I take mine with jalapeño. Hi Karen, it really is a nice change from "regular" coleslaw! Thanks for the comment. Hi Ashley, you can never go wrong with bacon, can you? Love the stuff! Thanks for the comment. You got me at bacon, John! This is one of the best coleslaw recipes I've ever seen! It sounds and looks delicious, but no jalapeño here for Bill. Celery seed is a must though. So many options for it and it's a must try. Thanks for the recipe! Hi Pam, this is really good even without the jalapeño. GOtta have the bacon, of course. :-) Thanks for the comment. Hi Raymund, good to have things spicy, isn't it? :-) Thanks for the comment. I've never been a big fan of creamy cole slaw, anyhow. Adding jalapeno to this is brilliant, John. Hi Rosemary we like to add jalapeno to everything! :-) Thanks for the comment.